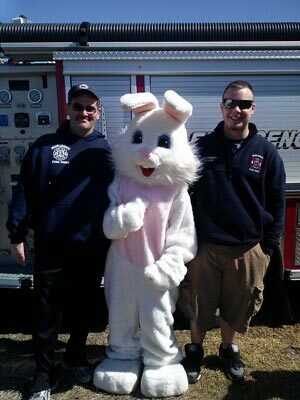 Unfortunately, Mr. Cottontail's smile turned to a frown when he learned he wouldn't pass Fire Academy with facial hair! We thank those who served before us. program is offered to teens 16 and up (14 and up if a parent is a member). They are able to help with non-emergency details, obtain training, and watch seasoned firefighters in action. This is a great way for young people to see if they want to pursue volunteering in their community, or even firefighting as a career. Currently, our Chief 3 and a number of other firefighters started out as Junior Firefighters. 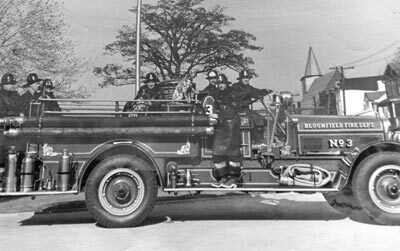 Our first truck was bought from Bloomfield, NJ Fire Dept. (above and below) Visit Our History page for more photos!